Google Panda 20 Loves Squidoo, Hates Hubpages? Two possible reasons for Hubpages’ Sep. 28 traffic crash were discussed by Paul Edmondson, head of HP, in this announcement post: (1) they’d added a “buy on Amazon” button to the Amazon capsule to try and tweak its utterly ineffective conversions and (2) they just entirely revamped Hubpages’ profile page, adding a “Hubpages activity” section at the bottom that might be diluting the SEO value of the profile by linking to a lot of spammy social chitchat. (1) is unlikely — I get plenty of Google traffic to pages like this with lots of nofollowed Amazon links — but (2) might be so. We believe it’s possible that one of these two changes started impacting traffic late last week, but aren’t sure which one, or if it’s the cause at all, but to be sure we are going to make some changes to test. Translation: “We’re flailing, but we’ll test this and that until we find something that seems to help.” (Site outages on Friday and Sunday didn’t help either, but Squidoo has outages now and then and doesn’t show traffic dips). Hub traffic is starting to recover on my own account, but is still off by about 20%. This was an interesting Panda update. Google was extremely cagey about it as SearchEngineLand’s write-up of Google Panda 20 explains. On Friday, September 28, Matt Cutts announced a separate EMD Google algorithm update, which removes the advantage the Google algorithm used to give to low-quality websites using an exact match domain name that fit a popular search query. (www.teethwhitening.com took a rankings dive, for example). Many people without exact-match domain names were noticing significant traffic changes over the weekend, during which time Matt Cutts resisted answering questions, but eventually SearchEngineLand called up Google and got a confirmation that yes, it was a Panda algorithm update. During a regular Panda update, the Panda algorithm evaluates all websites (i.e. domains like Squidoo.com), and then uses the overall Panda rating of the website as one big factor in determining how high or low to list pages from that website in search results. This is like colleges getting evaluated annually, after which employers use the college’s rating as one big factor in deciding whether to hire particular job applicants from that college. However, this was more than a regular Panda data refresh, in which it reevaluates all the colleges, er, websites. 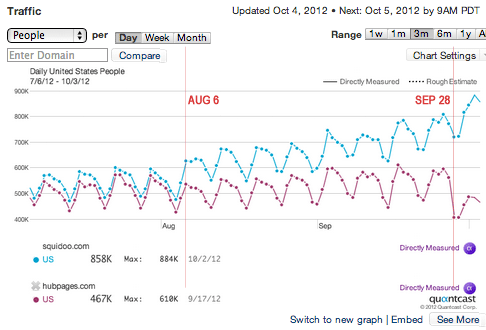 Instead, this was an algorithm refresh, which means Panda adjusted/tweaked the criteria it uses to evaluate websites. We don’t yet know what those criteria are— although at least some of them are listed in Google’s Inside Search blog post on Oct 4 (which unfortunately covers dozens of Google’s algorithm changes for the last two months, not just the Panda component). At any rate, it appears that the new algorithm rewarded Squidoo and punched Hubpages. As usual, my chief reason for comparing these two websites’ Panda fortunes is that I keep hoping I’ll detect differences between the two websites — and how Panda treats them — that shed light on what Panda actually is looking for. I still believe it was not a wise SEO move to noindex Pending Hubs. “Yo, Panda: from now on, Hubpages will not show search engines any fresh content until it’s stale, and we’re going to expect your searchbots to keep coming back to see when, randomly, we release new content from the noindex penalty box!” Maybe I’m crazy, but that just doesn’t seem like it would earn high marks from Panda. Again, stay tuned. Ugh! I have just reached the end of the HP Apprentice program. It was all going swimmingly well – traffic increasing slowly but steadily; earnings making well over the payout threshold and now, whoomph! I now have individual Squidoo lenses attracting more traffic than my whole HP account. I’m sitting here watching my numbers drop. However, on the brightside, my Squidoo account is receiving more traffic than ever and, while I’ve been neglecting lenses and lensrank has dropped a bit, sales are up and continuing upwards. Hubpages must sort this mess out! Thanks for shedding some light on this, GG. I think Hubpages will sort some of this mess out… they are trying to fix it. I just don’t agree with one of the things they’re doing to fix it! And on the bright side, also, I’m sure you picked up some tips from the Apprentice Program that are applicable anywhere. Congrats on the Squidoo sales uptick! I’ve been scouring the forums for answers, but so far, all I’ve got are just questions. About 3 or 4 days ago, I noticed a slump in my lenses’ traffic. I shrugged it off on the first day because I thought it was just a glitch. But the problem has persisted as of this writing. Could it be Google Panda’s doing? I’m not an expert in SEO, but I always watch the keywords and how my lenses rank. One of my lenses rank very highly on Google SERPs (even long tail keywords). But when I checked, it’s not ranking high anymore. It’s weird because you said Squidoo’s traffic spiked. If you have some explanation as regards this matter, I would really really appreciate it. I’m honestly waiting for you or Potpiegirl to pop up in the forums and provide some answers, but I can’t wait anymore. Thanks for your time to go over this. Blast it. I take a vacation from Squidoo for a month and traffic goes haywire. I don’t have answers yet, but I see the problem. I think it’d be better if hubpages do not publish a pending hub UNTIL it’s being approved. They should look at how WordPress works and why Google love WordPress so much, be it the WordPress.com blogs or most sites that use WordPress as their blogging platform. I know greekgeek from HubPages. We used to talk on there a few times. I took all of my stuff off the air. I am doing research. I do not know where I am going with on line blogging. I have a very small glimmer of hope about professional writing. I am largely very cynical and skeptical. I have some hope about personal blogging. I have no clear idea about what site to go to. WordPress seems quite legit. Every site has plusses and minuses. I used to enjoy talking to greekgeek on HP. I glanced, and read a couple of her articles today and discovered that she is all over the web. I had a huge falling out with both Hubpages and Google AdSense both. I have not recovered yet. Eventually I would like to do e-books. Frankly I do not know where I am going. I wound up researching Panda. It doesn’t look good.